Fuzzy sticks tinker to our creativity - We made a bouquet of flowers! Actually I had procrastinated the post, we made the flowers for last year Mother's day. Pipe cleaners come in beautiful colors and we can make a rainbow of flowers. 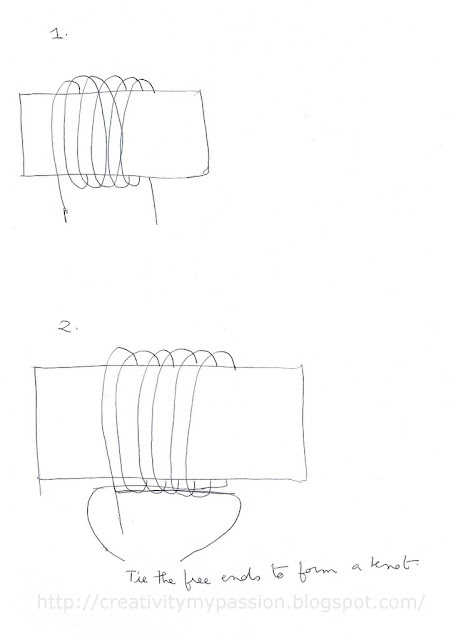 The rectangle shape in the pen sketch below is the folded toilet paper roll. Take the free end of the pipe cleaner on the left and insert it into the loops towards the right. Same way take the free end on the right and insert it into the loops toward the left. Make a knot with the free ends and secure the loops. Remove the loops slowly out of the roll. Slide in a Bamboo skewer/Dowel stick into the center knot. You can also hot glue the stick. Here are the finished flowers! Spruce up your mantel/table for Spring using the fuzzy stick flowers! 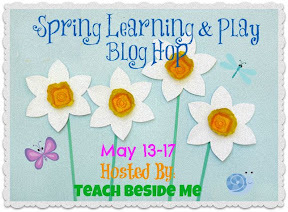 We are taking part in the Spring Learning and play Blog hop hosted by Teach Beside me. This post was part of the blog hop. Do stop by and share your wonderful Spring learning and play ideas!